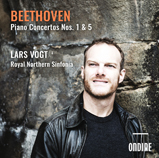 Lars Vogt continues his Ondine recordings with a new cycle of Beethoven’s Piano Concertos. Conducting the Royal Nothern Sinfonia from the keyboard Lars Vogt shows the brilliance and the beauty of these two majestic works of the classic piano concerto literature. Beethoven made an early reputation for himself as a keyboard player. Piano Concertos Nos. 1 & 5 feature two opposite sides in Beethoven’s career: the 1st concerto is a masterpiece by a young composer in his 20s who is already looking into new dimensions of musical expression. Although it was his first published piano concerto Beethoven had already made serious attemps in the genre – large part of the material to his 2nd concerto also predate the 1st concerto. The 5th concerto, commonly known as the Emperor concerto, was written between his 6th and 7th Symphonies when Vienna was under Napoleon’s occupation. During bombardment Beethoven, now 39 and increasingly deaf, had sheltered in the cellar of his brother, covering his head with a pillow against the noise of the cannons. Beethoven dedicated the work to Archduke Rudolph who had fled the city. Despite of its joyful, optimistic and hopeful character, occasionally echoes of war disrupt the work creating a strong impact. The work was premiered two years later in November 1811. Lars Vogt was appointed the first ever “Pianist in Residence” by the Berlin Philharmonic in 2003/04 and enjoys a high profile as a soloist and chamber musician. His debut solo recording on Ondine with Bach’s Goldberg Variations (ODE 1273-2) was released in August 2015 and has been a major critical success. The album’s tracks have also been streamed online over 6 million times. Lars Vogt started his tenure as Music Director of the Royal Northern Sinfonia in September 2015.